There is plenty for visitors to see and do besides play chess all day! The Bangkok Chess Club also meets every Friday evening at Woodstock Bar and Grill. Great food and special prices on the drinks. Take the skytrain to Thonglor station, and then bus, motorcycle, taxi or a good walk to Thonglor Soi 13: Woodstock Map. You can find more information at their website. Join the Bangkok Chess Club to be kept updated with details of our tournaments. It’s free, and there will be no spam or reselling of our list, guaranteed. Please fill in your full name and let us know what country you are from. 6 rounds Swiss system at Bangkok Boulevard , Ratchpruek Road , NonThaburi 11000 . TCA Prachuab Cup , Khun Prachuab is the Ex President of TCA . Not show up at 08:30 am , you may loss your seat to others . 7th BCC Open, Phuket Thailand. Report by Ian Rogers. The Bangkok Chess Club Open is arguably the world’s best open tournament. That definition can be readily challenged – the Aeroflot Open has hundreds more Grandmasters, the Pardubice Open attracts thousands more players and the World Open has far higher prize money. However the BCC Open, held in various cities around Thailand over the past six years, has a number of features which few other tournaments can match. Primary among them is the playing hall, always a spacious and lavish ballroom in a five star hotel. The organisers provide water and sometimes peanuts or other snacks for the players and, most importantly, the games are always played within 50 metres of a swimming pool. The 2007 BCC Open was held on the island paradise of Phuket at the end of March. Phuket was badly hit by the tsunami two years ago but has more or less fully recovered, the only signs of the tragedy were frequent signs advising the best escape path in the case of a new tsunami. Casting fears of a tsunami aside, 109 players from 30 countries arrived in the luxurious Graceland Resort and Spa for the tournament, among them four GMs. The event boasted a long list of sponsors, including Thailand’s oldest bank, the Siam Commercial Bank, and the Thai tourist authorities, who organised the visit of a baby elephant to the tournament to promote the event. With the temperature well above 30 degrees every day, the pool or the beach less than 150 metres away from the games – became an essential stop between rounds and, among the Europeans, sunburnt faces soon outnumbered normal pale chessplayers. In particular, Ukrainian Grandmaster Dmitri Komarov’s lobster-like appearance indicated that the second seed was not spending too much time in his room preparing for games. After nine rounds it was an IM, Australia’s David Smerdon who dominated the tournament, defeating top seed Rogelio ‘Joey’ Antonio in the fifth round and conceding only three draws, to the other GMs, in the nine rounds. Antonio recovered from his defeat to finish second while most of the other top seeds finished tied for third, including Komarov, Smerdon’s main rival for the first half of the tournament, Indian GM RB Ramesh tournament leader and this writer. 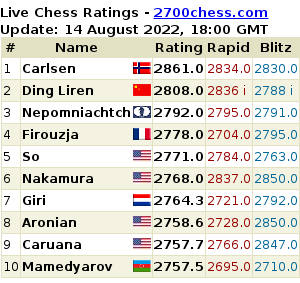 In the final round Smerdon needed only a draw for his second GM norm, but a win would give him outright first place and the 36,000 Baht first prize. Fortunately Smerdon exhibited nerves of steel in the decisive game below. Otherwise Black succeeds in exchanging his light-squared bishop without penalty usually an achievement in the Modern Benoni. Smerdon had pleasant memories of this line; in the last round of the 2006 Torino Olympiad he beat Peru’s rising star Emil Cordova after 12.Qc6 0-0 13.Qxd6 Nh5 14.f4 Re8 15.Bg2 Ra7 16.a5 Qh4 17.Ne2 Rc8! 18.e5 Bf8 when White’s queen was trapped. Here Smerdon realising that he was walking into his opponent’s preparation and not exactly playing a safe line , offered a draw, immediately declined. Not 15…Bxb2 16.Bxb2 Rxb2 17.Qc3!. Now Smerdon realised that his position was hanging by a thread. After long thought he found an inspired way to achieve counterplay. 19.Qxd7? would be met by 19…Qf3 20.Rg1 Bd4! 21.Rg2 Bxb2 with a crushing attack. Finally White starts to go astray, allowing the Black knight to gain activity. 22.a5 was necessary after which the White a pawn will be insurance against any problems. 26.Bd7 also loses to 26…e3!. If 27.Kf1, Rg4! forces checkmate. Smerdon’s luckiest break came in the first round, playing against one of the tournament’s sponsors, Martin Crichton the Irishman who helped four other Irish players come to Phuket. White has been in trouble for some time but Smerdon has prepared a surpise for his opponent. 29…Kh8, here or next move, should hold. 32.Rxh5+ Qxh5 33.Qe4+ would win Black’s queen but might not be enough to win, so Smerdon gambles that Black will again not retreat his king. With most Thais preferring Thai chess to international chess, it has always been an uphill struggle for the organisers to attract large numbers of local players to the BCC Open. However the recent appointment of a senior diplomat, the enthusaistic Dr Kantathi Suphamongkhan, as head of the Thailand Chess Association is likely to help chess in Thailand considerably. Suphamongkhan’s first jobs will be to encourage international chess among juniors and to find an experienced coach willing to come to work in Thailand both tasks which have defeated Thai administrators in the past. The top Thai player, Wisuwat Teerapabaisit, enjoyed some success in Phuket but was unlucky to miss out on a high placing by losing the following endgame in the final round. The natural move, but it seems to lose by force. After the immediate 48.Rxg2+! Black’s king is one tempo too slow in returning to stop the a pawn. Now the White king is cut off from defending the a pawn if it advances too far. 55.Rf5+ was perhaps a better try but after 55…Kg4 56.Rf7 Rg8! White is helpless. and Black, aware of the problems which some top players have had with queen versus rook in recent times Svidler and Morozevich spring to mind and therefore having subjected the endgame to some extra study, converted the queen versus rook without difficulty. =3. I.Rogers(Aus), R.Ramesh(Ind), M.Haag(Ger), D.Komarov(Ukr), S.Ansell(Eng), C.Van Dongen(Ned) 6.5.